Hollister Vikings Tiny Mite East played their first game away vs. the South Valley Grizzly's at Gunderson High School. Game captains for this game were Valencia #, Salcedo #21, Gonzalez #10 and G. Sanchez #59. On offense, Hutchinson #47, ran the ball 6 yards for the 1st down. On defense, Sanchez, #28 Parra J. #28 and Hutchinson #47 had a great group tackle. Then #21 Salcedo ran for a 3 yard gain. Then #47 Hutchinson ran the ball for 9 yards for a Viking 1st down. Canti #31 ran the ball for a gain of 5 yards. Hutchinson #47, ran the ball for a 16 yard gain and then 2 more yards for a Vikings Touchdown! Great blocking from the offense of line. Cortez #20 and Hutchinson #47, had a great defensive play with a 10 yard loss for the Grizzly's. Luna #32 , Cortez #20 Canti #31 had a good effort defense play group tackle. Cortez #20 and Luna #32 sacked the quarterback for a 4 yard loss. Head Coach Trent was proud of the effort the Tiny Mite Vikings East gave during the game. The defense did well not allowing the Grizzly's to score! Great job Vikings! Hollister Vikings Tiny Mite East will be hosting the Monterey Jets 8:30am this Saturday September 14th at San Benito High School. 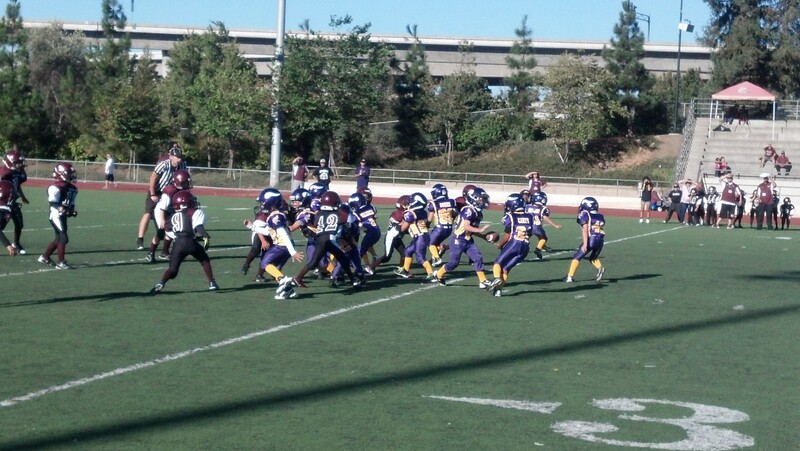 The Hollister Vikings returned to action against the South Valley Grizzlies on Saturday, September 7th at Gunderson High School in San Jose. The outcome was not what the Vikings wanted, but it was a hard fought game. The Grizzlies took a 6-0 lead after a long touchdown run to the outside. The Viking defense did a great job throughout the game, led by the strong play of Donnie Gutierrez and Loren Snead. The Grizzlies ended the half with another touchdown run to take a 12-0 halftime lead. Other Viking players who had a strong game were Gabriel Camacho, Jason Rianda, and Adrian Ruiz. The Vikings started the second half with the ball, but were unable to get any points on the board due to the tough Grizzly defense. The Grizzlies scored another touchdown after a short punt by the Vikings left them in great field position. The Vikings kept their chins up and fought back with a long touchdown run by Isaiha Molina. Although the Viking offense had many opportunities to get on the board, the game ended with a final of 18-6. Other Viking players who had a strong game for the offense wee Manuel Delgado, Mateo Dozal and Jayden Romero. Coach Jesus Romero felt the boys did a great job, especially in the second half. “The boys really stepped up in the second half. They adjusted to the changes we put in place. We just ran out of time.” said Romero. Coach Sal Sanchez was very proud of his defense, “The line really got in there today. Lots of pressure on the quarterback.” The Mitey Mite Vikings will be at home to face the Monterey Jets at 11:30 next Saturday.